This recipe for butter pecan fudge is so delicious you will be tempted to eat the whole pan! Keep reading to learn how to make it. My family asks me to make this butter pecan fudge recipe for every holiday. It has a lovely buttery flavor and is chock full of nuts. It is definitely one of my family’s favorite holiday sweets. If you make this holiday fudge recipe, be sure to cut it into really small pieces. This butter pecan fudge is sinfully rich! A little bit is all you need. The nice thing about this fudge recipe is that you can make it fairly quickly. The mixture just needs to boil a few minutes on the stove. From start to finish, making fudge from scratch using this recipe takes just 15 to 20 minutes. To print this butter pecan fudge recipe, right click on it to open the image in a new tab. Then use your browser settings to print it. You might need to go into your printer settings and adjust your paper size to 4″x6″ to get it to print in the correct size. You really do need to sift your powdered sugar before you measure it. This ensures you don’t add too much powdered sugar to your recipe. In a large saucepan, combine the butter, sugar, brown sugar, heavy whipping cream, and salt. Over medium low heat, bring the mixture to a boil. Add your candy thermometer to the pan. Whisking constantly, boil until the mixture reaches 230 degrees. Sift your powdered sugar. 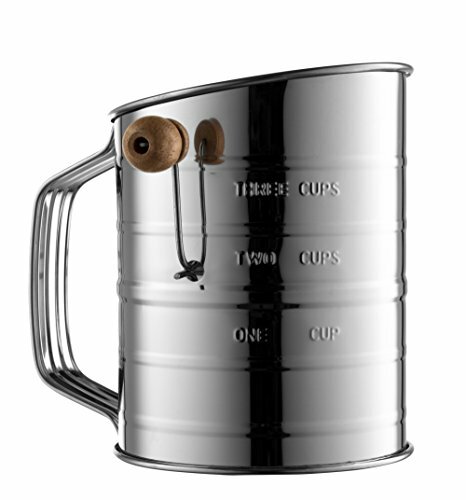 If you don’t have a flour sifter, it works just as well to use a fine mesh strainer. After you sift the powdered sugar to remove clumps, measure out the 2 cups. Stir the powdered sugar into your mixture, stirring until smooth. Fold in the chopped pecans. Pour into your prepared baking dish. Spread to smooth out the fudge in the pan. Press the whole pecans on to the top of the soft butter pecan fudge for garnish. Allow to cool to room temperature then cut into small squares. Store this soft butter pecan fudge in the refrigerator in an airtight container. I get asked a lot why you need to use a candy thermometer for this recipe for butter pecan fudge. The simple answer is – Consistency! Every stove is different – a gas stove behaves differently than an electric one. So to ensure that your holiday fudge recipe turns out great each and every time, I recommend using a candy thermometer. I’ve had my candy thermometer for ages and always use it when I am making candy. It is one of the metal and glass ones where the red liquid in the tube rises as the temperature increases. It has a clip so it hangs right on the side of your pan. The one downside to the candy thermometer I have is that sometimes it can be hard to read when you have a steaming boiling mixture in the pan. 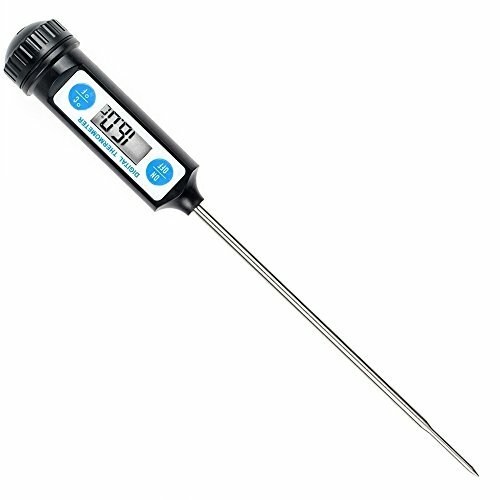 So I have my eye on this instant read digital candy thermometer. It goes up to 300 degrees F, which is the hard crack stage – making it perfect for any of the holiday candy recipes I make. Silicone 8″ Square Baking Pan w/ Steel Frame + Handles. Whenever I make a fudge recipe, I allow it to cool in a silicone baking pan. After it cools, you just flip it over onto a cutting board and the fudge comes right out. You don’t even have to grease the pan! An 8 inch square baking pan is the perfect size for holding a batch of fudge. 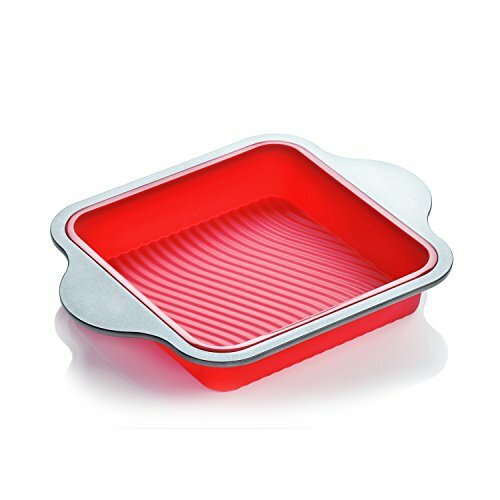 I like this silicone baking pan because it has stainless steel handles. Most silicone pans sag when they are full, so you need to sit them on a baking sheet for moving. That isn’t an issue with this particular pan because it has a stainless steel frame and handles to help it hold its shape while you transfer it into the fridge . If you make this recipe for butter pecan fudge, you will have to let me know how you liked it. While you are here, be sure to check out the rest of our Christmas Crafts and Recipes. So tell me… What are your favorite candy recipes to make during the holidays? This recipe looks easy and delicious. Fudge is just a great once a year treat. Oh yum! These sound great! Nice to meet you Sabrina! Ooh, this looks so yummy! I love butter pecan and fudge so it sounds like a match made in heaven. 🙂 Thanks so much for linking up to Funtastic Friday! Looks delicious. Thank you for linking up with us at #HomeMattersParty . We would love to have you again next week . That pan is awesome – I gotta get one! Thank you so much for this recipe! I fell in love with some store-bought butter pecan fudge a few years ago, but haven’t been able to find it since. Homemade is better anyways! I agree Jenny – homemade is so much better than store-bought! Thanks for visiting. Jen, I love butter pecan and I love fudge. This combination has my mouth watering! I am definitely going to whip this up this holiday season. After all the hard work cleaning, decorating and shopping, mama needs to get herself a present too! The name alone has me drooling. Thanks for the step by step pictures and thank you for sharing with us this week at Celebrate Your Story, have a great weekend.